Taekwondo is a wonderful martial art and a great form of exercise. This is a fighting sport that will improve your fitness and wellbeing, improve your mental focus, teach discipline and respect, make you stronger, more flexible, and more heart healthy too. You will make new friends, develop self-confidence and learn a very effective way to defend yourself. The main purpose of TaekwonDo is to learn self-defence. 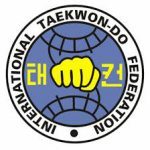 Taekwondo originally came from Korea and is now considered one of the most effective and popular martial arts in the world. Taekwondo has as much to do with mental discipline as it does with physical discipline. Learning the various aspects of TaekwonDo and perfecting them involves goal setting. Taekwondo teaches you that nothing in life worth having is always easy to obtain and that every goal you set requires a disciplined approach. Taekwondo is a group activity. Humans are by nature gregarious creatures and that means that we don’t like to be alone. Taekwondo is a great way to get out of the house, meet new people and make new friends. Practising TaekwonDo on a regular basis will increase your self-confidence and self-esteem. As you progress, your confidence will grow because of what you have accomplished. You will notice improved muscle tone and weight loss, and when you look better you also tend to feel better. Taekwondo teaches you how to defend yourself, and knowing that you can hold your own in a tough situation definitely inspires confidence and self-esteem. Taekwondo training will definitely improve your cardiovascular fitness. It takes a lot of cardiovascular endurance to be able to get through a class. This is something you will build up to, and be surprised at how your general fitness has improved. Moreover, while a TaekwonDo class is not the same as going for a run, the constant physical motion will get your heart pumping. Taekwondo is a fantastic way to improve flexibility. We always start with a warm-up and gradually move into stretching which is beneficial because it loosens your muscles, getting them ready for strenuous activity and greatly reducing the chances of injury. It is not unusual for beginner students to be very inflexible, but after a while, they find that their range of motion has dramatically improved. At SCMA we apply scientific principles when stretching to avoid injury. Practising Taekwondo on a regular basis can make you feel happier. Exercising causes your brain to produce neurochemicals, the most important of which is Serotonin, producing feelings of happiness, elation, and calmness. Therefore, TaekwonDo training, as with any form of exercise, can help to improve low feelings and combat stress. 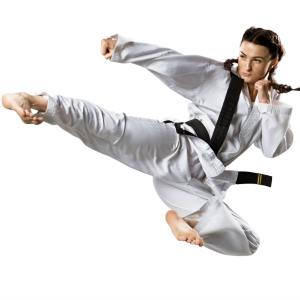 Regular TaekwonDo training will improve your strength and muscle tone. A typical class involves lots of body weight exercises such as push-ups, abdominal crunch and plank, to help develop core strength. As a weight-bearing exercise, Taekwondo can help to strengthen bones. Every time you put an increased amount of weight on your bones, or you cause them to receive impact, such as when you do a kick, it causes your osteoblasts to lay down bone matter. Technically speaking, your bones grow in much the same way as your muscles grow, and the more you train them with weight-bearing exercises, the stronger they get. Taekwondo training will definitely help you to burn calories and lose weight, as part of your training program. Regular physical exercise increases your metabolic rate on a fairly long-term basis, thus making your body burn more calories even after you have finished exercising, which is very important for weight loss and maintaining a healthy weight. Taekwondo involves taking very clear and precise instructions from an Instructor, who will usually be a senior black belt. It is very important to follow these instructions and show the required level of courtesy and respect. Martial arts, especially those originating from Asia, are based upon respect for elders/seniors. Failure to show the correct courtesy or not following instructions is not tolerated in the Dojang (trying hall). Therefore Taekwondo is a fantastic way to teach kids some respect, and reinforce good behaviour and social values which should be taught both at home and in schools. Come along to SCMA and see for yourself. You get 2 free training sessions so you can be sure you have made the right choice. With all of the benefits above, what have you got to lose?